Round 3 of the Riverina Cup Raced and Won! 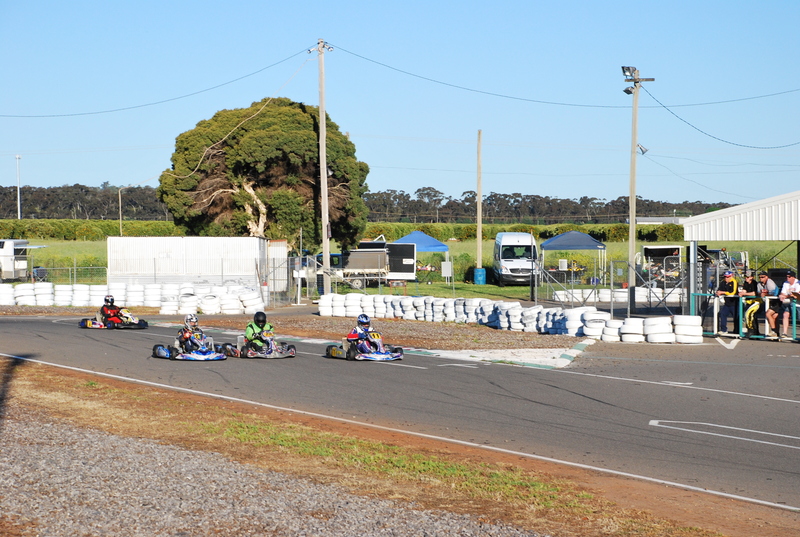 Griffith Kart Club held the final round of the Riverina Cup on Saturday October 15, 2016. With thanks for the continued support of Gary & Scott Rapmund from Riverina Go-Kart Centre who sponsored the Senior Trophy and Kris Centofanti from Intense Karting for sponsoring the Junior Trophy. The series is run over three race meetings and provides great competition and brings together drivers from all over the region. There are two categories, Senior & Junior and each winner is presented with a perpetual trophy they is kept for the year and returned when the series is run the following year. All drivers also race for trophies on the day with 1st, 2nd and 3rd places on the podium. The series gained strength with numbers improving over the three rounds.Thanks go out to Wagga & District Kart Club for making this round count as part of their club championship, the extra drivers made the racing fantastic. We also thank members from Albury Kart Club and Griffith Kart Club for racing on the day.Racing commenced at 2.00pm and ran into the evening under lights. The format was three ten lap heats with a twelve lap pre-final and a twelve lap final. All races counted and winners were announced after the event. The day started of with a combined class of two cadet 9 and four cadet 12 drivers battling out for honours. In Cadet 12 Noah Sands and William Garner continued their battle for the top spot with some drama in the opening heat when a racing incident saw both drivers with a DNF. This allowed Albury Driver Ethan Smead capitalise with a victory on his first race in Griffith and Ky Young taking out second place in heat 1. Noak Sands and Will Garner battled the rest of the day with some close racing and good skills on show. Final results for Cadet 12 was Noah Sands was 1st, Ethan Smead 2nd and Will Garner 3rd. It was great to see William and Ky Post personal best times and continue to improve and thanks go out to Ethan Smead for going so well at his first Griffith Meeting. In cadet 9 it was great to see LIam Mitchell and Brock Wilson have a great race,on track with the Cadet 12’s. Liam held is own to claim first place in Cadet 9 and Brock Wilson showed he is star of the future securing 2nd place and making all his supporters proud. KA3 Junior and KA4 Junior Heavy were run as a combined class with some close and skillful racing. In KA3 Junior Tysen Ennes,the only Griffith driver battled it out all day to pick up 2nd place. Will Longmore took out 1st place and Preston Bruest 3rd position on the podium. The Wagga drivers drove hard and it was great to see close competition and clean driving by all drivers. Tysen gave Will and good run but ultimately the experience of Longmore proved to deciding factor. In KA4 Junior Heavy once again saw Mikayla Boots show the boys up to take out 1st place. Spencer Bradley kept the racing clean and will be racing off his P Plates soon. KA3 senior light ands KA3 senior heavy were run as a combined class which provided 8 karts on track for some fast racing. KA3 Senior Light proved to be a local battle up front between the very fast Stewart Weigand and smooth as silk Byron Woolner. The days racing was close but Stewart had the wood on both Byron and Martin Hosie to close out first place with Byron 2nd and Martin 3rd. KA3 senior heavy saw 3 Griffith Karters battle it out with the out of town competitors.Heat 1 saw a crash in turn 2 ending Blake Snaidero’s day almost before it began, this was a huge shame as he was showing some good pace in practise. Tight racing continued all day with Jason Bailey, Brendon Schade, Ben Jones and Harrison Post having a great time showing off just how fast they could lap the Griffith Circuit. In the end Jason Bailey was 1st, Brendan Schade 2nd and Ben Jones came in 3rd. TAG 125 Light and Heavy were run as a combined class that saw 5 drivers on track to compete for the victory. In TAG 125 Clint Everingham took out the win from Harrison Post and the TAG 125 Heavy saw Gary Wheeler win from Brendon Schade with Jarreth Argus in 3rd place. No Griffith drivers competed in this class so many thanks to our visitors for showcasing just how fast the TAG-125 unrestricted karts are. KA4 Senior Light and KA4 Senior Heavy were combined on track to provide 4 karts and drivers were from visiting clubs, In the lights it was Greg Jensen rubbing it in by taking 1st place from Joel Jensen in 2nd and Natasha Jensen in 3rd. Chris Bradley was the only competitor in the heavy class and picked up a trophy for his efforts. The final class saw TAG Restricted light and heavy combined on track for an 8 kart field. This provided some great racing with several competitors evenly matched. In Lights Jarrad Wilson continued his battle with James O’Callaghan from round 1. Brothers William and John-Ross Wood showed massive improvement as they continue to develop their race craft and battle past the very fast heavies of John Macey and Ben Boots. Two newcomers to kart racing was Adam Waide and Geoff O’Callaghan who drove the wheels off their karts and had a great battle all day. In the end the form of James O’Callaghan was too good and he took the 1st place position from a very fast Jarrad Wilson and in 3rd place was John-Ross Wood who is looking for to getting off his P Plates. In TAG restricted heavy John Macey and Ben Boots went head to head all day with John taking out 1st and Ben boots 2nd. John showed his experience to take the win but Ben had one DNF with mechanical issue that ended his challenge.